Nick Young (Henry Golding) is returning home to Singapore to be the best man in his best friend Colin’s (Chris Pang) wedding to Arminta (Sonoya Mizuno). He decides that this would be a good opportunity to take his girlfriend Rachel Chu (Wu) to meet his family. While Nick is busy doing best man things with Colin, Rachel visits her college roommate Peik Lin (Awkwafina). While at dinner with Peik Lin’s family, Rachel learns that Nick’s family is one of the wealthiest families in Singapore, something he never told her. When Rachel gets to a party at Nick’s family’s home, she is overwhelmed by both the size and grandeur of the home, as well as the number of guests attending. She thought it would be a small family affair. She stumbles her way through meeting the Young family and their friends. The only comfort she finds is when she runs into Nick’s cousin Astrid (Gemma Chan). If the party itself wasn’t daunting enough, Rachel’s meeting with Nick’s mother Eleanor (Michelle Yeoh) makes it even more uncomfortable. Eleanor isn’t happy that Nick has been away from home for so long and that he is dating an American-born woman who isn’t from a wealthy family. Ah Ma (Lisa Lu), Nick’s grandmother, on the other hand, takes more of a liking to Rachel. Things go from bad to worse when Rachel sets off for Arminta’s weekend bachelorette party with the girls, all of whom resent Rachel for stealing one of the most desirable men in Singapore. Thrust into a world where she doesn’t fit in may be more than she can handle. 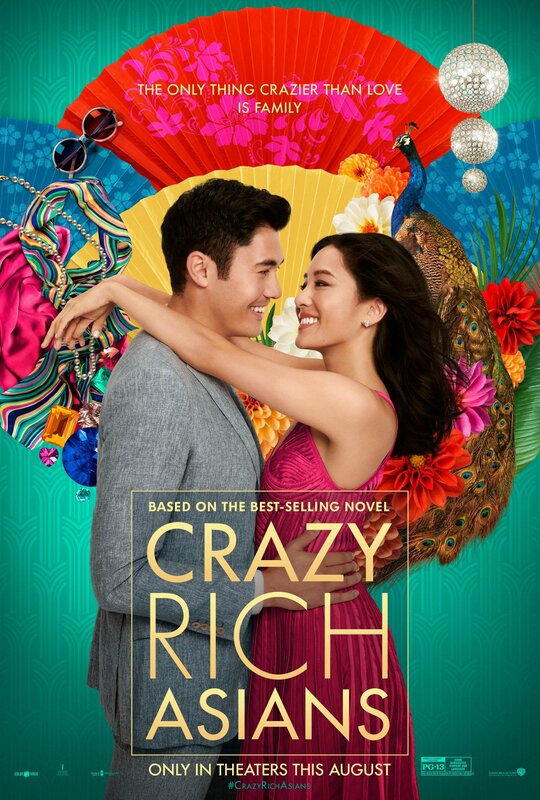 Based on Kevin Kwan’s novel of the same name, Crazy Rich Asians explores familial relationships of the ultra-wealthy where status and image are the most important parts of life. Constance Wu has been a fierce advocate for representation in film and television. This makes it no surprise that she would star in the first major Hollywood movie in 25 years to feature an all Asian cast. Wu balances her sly wit with some emotional moments to give an excellent performance. Her humor is more on the subtle side, allowing her to showcase her range throughout the movie. Opposite Wu is Henry Golding as the heir apparent to a wealthy family whose ambitions don’t align with those of his family. He is more caring and down to earth than most of his relatives, who lavish their lavish lifestyles. Michelle Yeoh is Nick’s stern mother. Her primary focus is making sure nothing or no one can tarnish the family legacy. She sees Rachel as a threat in this respect. Yeoh’s icy demeanor and disdain for her son’s choices are well-played. Ken Jeong, obviously, is in the film to give it more of a comedic edge but it is Awkwafina who really makes it funny. It’s hard not to focus on her as she steals every scene she’s in. She takes it from being a typical rom-com to having some truly hilarious moments. The story follows the same formula as almost every other romantic comedy. You can check off just about every rom-com cliché as the movie progresses. It is in the execution, however, that makes the film stand out. From the well written script, to the direction, to the cinematography – I don’t know how you walk away from this film not wanting to visit Singapore – everything is expertly done. More than just an entertaining, fun way to wrap up the summer movie season, Crazy Rich Asians is important for Hollywood inclusion. Sending you on a funny and emotional journey through magnificent backdrops, this is a movie you will want to see.